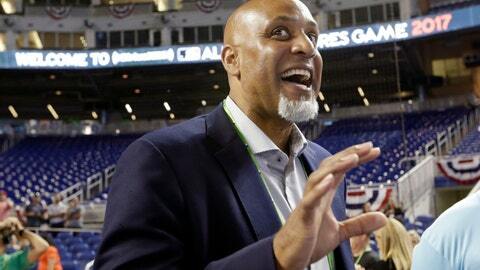 IRVING, Texas (AP) — Tony Clark’s contract as executive director of the Major League Baseball Players Association was extended through 2022, a year past the expiration of the current collective bargaining agreement with MLB. The former All-Star first baseman became executive director after previous union head Michael Weiner died in 2013, and Clark led negotiations for a labor contract covering 2017-21. “As much as anything, the engagement of our guys, the interest that they have, both now and moving forward, being connected to that, supportive of that, and leading them through that is something that I’m grateful for the opportunity to do,” Clark said Wednesday after the MLBPA finished its annual executive board meeting. This week’s meeting was at the same North Texas resort hotel where Clark and the MLPBA met two years ago with management and reached a verbal agreement on the current labor contract. In August, the union made a key addition to its staff when it hired Bruce Meyer as senior director of collective bargaining and legal. There were increased tensions between players and management when dozens of experienced free agents went unsigned into spring training this year — and some even much longer. Two weeks into spring training, about one-third of the 166 players who exercised free agency rights last November hadn’t reached contract agreements. There are about 150 free agents right now early in this offseason. Asked whether he felt things would be different this time, Clark said he is “cautiously optimistic” that they will. Clark said there have been a number of informal conversations with MLB and Commissioner Rob Manfred during the last few months trying to get an idea of what talks the sides are interested in having during the offseason. Pace of play has been an ongoing discussion for several years, and now there are also on-field items such as the drastic defensive shifts being used by some teams and the increased use of relievers on pitching staffs, including some in the role of “openers” to start games. While not getting into specifics about where those issues could go, and how exactly they were discussed, Clark said the players have always had a passion for the game and remain committed to it.